The 1oz Gold Britannia is one of the most popular investment coins in the world and you can now order the 2018 edition with coininvest.com. The Gold Britannia is also one of the British Royal Mint's most successful products, along with its signature coin, the Gold Sovereign. The Britannia made its debut as a .917 (22-carat) gold coin in 1987 – each coin had a gold content of 91.7% and the remainder was copper prior to 1990 and silver afterwards. Since 2013, the Britannia has been minted from .9999 (24 carat gold),making it one the purest gold bullion coins available. 2018 1oz Gold Britannia coins will be in as much demand as ever. Still one of the most popular options for private investors in the UK, the iconic coin celebrated its 40th anniversary in 2017. Gold is considered one of the safest choices for investors and many people choose the 1oz Britannia when they wish to convert capital or add precious metal to pension plans. Why invest in the 2018 1oz Gold Britannia? 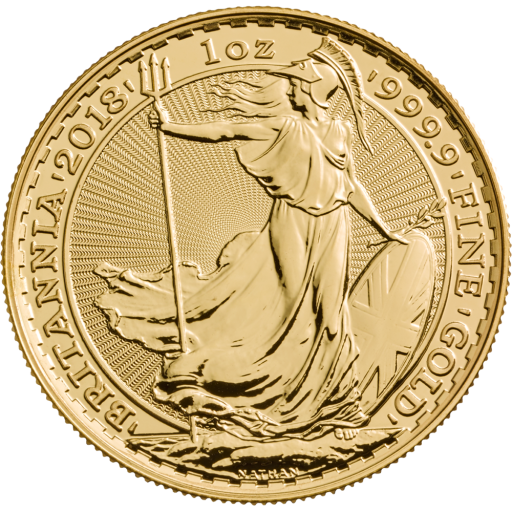 Its classic reverse design and unique details attract collectors while investors choose the 2018 1oz Gold Britannia for its high gold content and outstanding quality. Like all British legal tender coinage, the 1oz 2018 Gold Britannia is exempt from Capital Gains Tax (CGT); invest today and, should you choose to sell at any point in the future, you won't be taxed on your profit. Order the 2018 1oz Gold Britannia with coininvest.com and boost your portfolio's value with fine 24-carat gold (99.99%). These beautiful coins are individually packaged in sachets or available in tubes of 10 or boxes of 100.